January 27, 2018: Barb--thanks for your information. 12/31/2017: Joyce Pike; I bought a dress a couple months ago for a 24 inch Deluxe Reading doll, and was very pleased with it. Fits beautifully, and so well made! July 14, 2017// Juanita Dembo: I ordered 2 dresses for 2 of my Shirley Temple dolls and they were even more beautiful than what was displayed on the site. Shoes and socks were just adorable. I will be back! March 18, 2017. Jennifer Dean: LOVED the outfits for my Saucy Walker. Soooo sweet! Thank you. GREAT collection of Little Miss No Name dolls. They truly are my favorite. You must be so proud. You made the black pants with white blouse for me and I get such great pleasure from them. My sister made me a set when I was about 10 (68 now) and you copied my idea for the Revlon doll I purchased. I have them in a special hutch that I look at every day when I pass it in the hall. Annette Glover: I recently had my American Character 16 inch Baby doll of 57 years old restored and purchased the outfit from you. She is now going to my 4year old Grand Daughter for her 5th birthday. She came beautiful & the outfit I purchased was perfect! Such quality and attention to detail...I thank you so much! February 12, 2015: Outstanding workmanship and very reasonably priced! Very honest person to do business with! Love my Cuddle Up outfit! Would do business with again. Unbelievable!!!! My poor pitiful Tiny Tears looks like the sweet baby she should look like. The elegant wedding dress for my Jan doll with all its lace and frill is more than any girl (Jan or me!) could dream of. What absolutely beautiful work you have done! Amazing!! Thank you, thank you, thank you! Your talent is so very much appreciated. Honestly, I so appreciate that you make this service available. Sharing your talents make others so happy. 9/13/2014: The items I have bought from Jan's doll closet have been the best quality, The workmanship and detail have been exquisite. The price for all you get in the package is unbeatable. The compliments I receive when my dolls wear her outfits are most well deserved. They make me so very proud to wear such fine clothing. It is by far the best! 05/28/14: Linda Sumrall ~ Absolutely amazing little doll clothes and the best variety I've found! Beautiful work! 9/24/13: Nancy Richner: Thanks so much for the pink polkadot outfit for my 12" Betsy Wetsy. It is just too adorable! 9/13/13: Nancy Richner: I love your site! All the doll clothes are so lovely. Can't wait to receive my order! Looking at the "Pictures" pages was a treat! Jan has made at least a half-dozen outfits for my 1951 Bonny Braids Walker doll. They are all a delight. She will make clothes tailored to special order requests (such as my asking for a variation in what she was offering and also having her make a an outfit from "back in the day" using vintage doll clothes patterns. Her workmanship and service are outstanding and she is a joy to work with! 5/20/13 from Kate Drohan: Well, Jan, you've done it again!! Another absolutely beautiful outfit, or should I say 2 outfits... received the pink and white ric-rack outfits for Baby and Bobby Dear One today..can't describe how absolutely adorable they look!! Made to perfection!! Anyone who has these twins should be ordering these, also the Christmas outfits (I like to spoil my babies with the best clothes) and the BEST is from Jan's Doll Closet!!! 3/19/13 Pat Hyden: Great clothes and made to perfection. Love your doll clothes. If I could afford to buy some and then sell on ebay would be fun. Kate Drohan: Received the Baby Dear One and Bobby Dear One Christmas outfits today and I couldn't be more pleased. They are an exact replica of the original outfits made in 1962! I love everything about them, down to Bobby's adorable hat! Thanks Jan for another wonderful creation!!! Hi Jan, I just had to show you your cute pjs! They came just at the right time, with the blizzard we got! Lol These babies are now nice n cozy thanks to you. I love the pjs. Thank you so much and you know I will be ordering spring outfits! If this snow ever melts! Take care. Your outfits are the best! I special ordered the white and yellow gingham outfit for my 19" Thumbelina doll. It arrived almost instantly and is absolutely beautiful. I will use your services again. 3/8/12: Gina ~ Beautiful Pippi outfit for my whimsie doll, she looks fabulous. Beautifully made! 03/03/2012... Darla: Your work is beautiful. 02/28/12... Erica: I ordered three outfits for my Tearie Dearie doll. The order was filled quickly; the outfits are gorgeous, well-made, and have fantastic details (shoes with buckles, hand-made rosettes, lace, etc.) Definitely worth the time and money. 11/5/11... Linda Sumrall: I just received the pink robe set for my Sparkle Plenty doll. It is so sweet and looks so much like the original. The product and the service are great! Thanks. 11/01/11... Heather Williams... Great site loved the dolls and the clothes. 9/17/11... Kate Drohan ... Just received the playset for the 23" Dryper Baby and it is amazing! I love how every little detail is there and everything is beautifully made. I will be placing a future order with you and recommending you to friends! 8/9/11...Lilian Swenson: You have an amazing site. Well Done. I really like all the work you have done. Pat Ware have loved looking at your doll clothes and hope to place an order. From Kathy of Jupiter, FL: Good Morning Jan o my goodness just awesome clothes I love em your work is increditable. Thanks so much for getting everything to me on time for my doll show I have a friend who is looking at your clothes also you are very talented seamstress I will be buying more from you . Reenie Wood : WOW, HAVE I ENJOYED YOUR SITE!!!! WHERE HAVE YOU BEEN THAT IT TOOK SO LONG TO FIND IT!!! AND NOWHERE BUT YOUR SITE HAVE I FOUND ANY REFERENCE TO THE 8 INCH BETSY WETSY DOLL. WOULD YOU BE SO KIND AS TO TELL ME HOW ONE KNOWS IT IS A BETSY AND NOT A LOOK ALIKE. THE ONE I HAVE NOW HAS WHAT LOOKS LIKE VOO STAMPED ON HER BOTTOM NEXT TO A METAL AIR HOLE THING. IS IT A BETSY. HAS MOLDED HAIR. THANKS SO MUCH AND NOW I CAN GET BACK TO LOOKING AT YOUR SITE. GREAT, GREAT DOLL SITE!!! Thank you for cool site. Pat: Wow! I just looked over your web site. It is fantastic. You put so much work and love into your dolls. I just love the looks of the old dolls. They had so much ...character... like older homes, which I also love. (sorry Pat, I lost your wishes, so used this- thanks so much for the lovely doll. I will take very good care of her). I make crafty dolls and sell craft shows. Your dolls and bears are beautiful. beautiful dress it is. I am so glad I found Jan's Doll Closet. Hello, it's very good site. I received my doll’s dress yesterday. It is so beautiful. I just love it!!! It fits her perfect, even the skates. I have a red snowflake bedspread on my bed and she is standing between the pillows. She is a perfect doll too and she came with a dress that was tattered and too small. She looks like a new doll now. She was from the 1950’s. I have a red snowflake bedspread on my bed and she is standing between the pillows. She is a perfect doll too and she came with a dress that was tattered and too small. She looks like a new doll now. She was from the 1950’s. Very nice items on the webpage. I'd like to see doll clothes made for the 18" dolls that are international clothing, like a czech dress and/or and Irish dress. This is a fabulous site, I enjoyed it very much. I have an effanbee Fluffy doll. I saw the outfit you have on your site. It is adorable! Do you have any other outfits for her? I also have an EEGEE Baby Susan 8". I believe both of these dolls are from the 1950's. I'll be back with you. Wonderful site. Viktor from Paris... Good site! Good design! Good work! You’ve a very nice site where is possible to find interesting information. This is a great site enjoy surfing into it. Thanks for all the information you provide. I love your website music and couldn't resist the dress for my new Ann Estelle (she hasn't even arrived yet). Thanks for making such a cute outfit. Sincerely - Nancy T.
Jan, Your Dolls look beautiful you are truly gifted.The Outfits you made make them look brand new again. The older dolls are much nicer than some of the new dolls out today. Keep up the good work wish I had a talent like that. Karla R. Kunert of Romney, Indiana writes: What a wonderful site! It takes me back thru the years to see photos of the dolls that I played with as a child. I enjoy seeing where other people are from who visit your site. You have done a very nice job with your website, Keep up the good work! It will be interesting to watch your website grow as more people find out about it. ~~~~~~~~~~~~~~~~~~~~~~~~~~~~~~~~~~~~~~~~~Bency of California is looking for: VERY FINE SATIN CLOTHES FOR THE DOLL. You have a very nice website. I enjoyed browsing through it. Your doll clothes are absolutely beautiful. ***I received the outfit today. I thought it was so cute! Thank you so much! Sharon B.
Jan - I just opened up the Shirley Temple doll dresses & nothing has pleased me more than this - I'm sitting here just crying w/joy - these are absolutle beautiful - just perfect. I HAD A DIFFICULT TIME FINDING SOMEONE WHO WOULD MAKE CLOTHES SMALL ENOUGH (TO FIT A 10 INCH BEAR) SO I AM DELIGHTED TO FIND YOU. THANK YOU VERY MUCH. I was thrilled to find the Kellogg doll on your site. I had one as a child in the 50's, my dear grandmother had gotten her for me. Now I can have one again. Mine had many lovely little clothes, her original outfit was a red and white checkered dress and matching bonnet. Sharon Lucchesi from Stockton, California writes: First time visitor to your webpage. The "dialog" that accompany the photos of your dolls are so sweet that I found myself wanting to keep going to the next photo to see what the other dollies had to say. I really enjoyed reading all of them. Your doll clothes are very beautiful and kept to the style of the era the dolls were from and because of it they all looked quite appealing and took me back in time when I first got my dolls of the 40's & 50's. 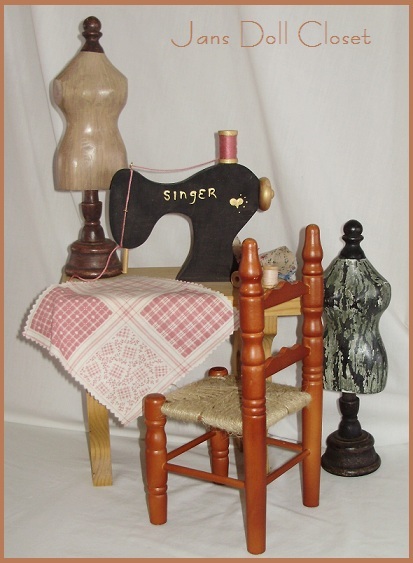 I will look forward to returning to your site again and when I get time to measure my own dolls I may find they need some new clothes from Jans Doll Closet. Tara writes: We received the TUX today! It is SO SO cute! "Ziggy" looks great in it, it fits him perfectly!Thank you again! I will send you a pic of him at the wedding :) Thanks! Dear Jan, I just got my doll clothes today and couldn't wait to dress her up. She looks great. You did such a wonderful job on her out fit and it is just as I remembered her looking. Hi there, really enjoyed your web site. I received the dress in great condition today (Friday). Everything is great and I really like the dress. Thanks. You have a very nice site. I love my dolls, and I am thrilled to have purchased the dolls I had when I was young, and to have bought dolls that I never had. Like Patsy Joan and Ann. And my Arranbee ice skating doll, I saw her picture in Modern doll, and am lucking to have her. I would like to see more clothes for Patsy Ann 19 inch, 18" Arranbee Composition, P-91 Toni, P-93 and 16" molded hair Betsy Wetsy. Hi Jan, what an awesome website, you did an EXCELLENT job! I have started sewing again, but will keep checking out your site. I really like your website. I've purchased two doll outfits from you in the past through Ebay and they're beautiful. You do great work. I will be visiting your site again soon. My Betsy (who's not in tip-top shape but is beautiful to my eyes) is now dressed in your perfect clothes! She cannot believe her good fortune after suffering the trip to a new home (wearing nothing but a plastic diaper, a baby undershirt, and pink socks) and not knowing what lay ahead. And now, she looks like a princess, with her new dress, bonnet, unders, socks, and shoes!! The clothes are just lovely. I thank you so very much for all your work and for being so incredibly fast to get these things to me. The dresses are absolutely fabulous. I will have the best dressed Kissys this St. Patrick's Day. I love the little lace collars. They add a lovely extra touch. Thanks so much for your fine work and your speedy stitching! From Beverly of Beaverton, Oregon:What a pleasure to find all the special outfits I need for my dolls in one place. Thanks Jan.
Just wanted to let you know the dress got here today and it is just beautiful. I could not wait to get it on my doll. She looks very pretty and is all ready for Thanksgiving company now. Jan's the best! Don't know what I would do without her... she is very gracious and more than helpful! easy to navigate, easy to read, great pictures that clearly show exactly what you can do, and give lots of ideas. I also like your Price guide, which has even more info like lots of lace/no lace, underclothing, etc etc. Now I know you also do pants and shirts for boys, who are really difficult to buy good clothing for. I received the package today. All of the clothes are beauitful especially the bib, thank you. Pebbles hair bones are great! I got the darling dress and accessories yesterday. They are so nice. Thanks again for them. Also...everything you send smells SOOOOO good. Hi Jan, very nice site and I love all the Christmas icons. I received the Baby outfit yesterday. It is so cute, I love it and my baby looks so cute in it. I think you are a very talented and sincere person and I am honored to have your lovely outfits for my Tiny Tears! I have three 16", one brunette 15" and an adorable 11" and I love putting them in little frilly dresses and bonnets. Thanks for the fun and glamour! The dress is adorable, thank you so much. I just love the color and so does my husband Kenny. Slip is so cute. That's a plus for sure. You do wonderful work and make many dollies happy to be wearing a new outfit top to bottom. Thanks again. I appreciate you so....and I do want to say that you are fabulous in your work and in fact I was telling my husband and showing him the wonderful work you did in creating that little outfit for my Shirley doll.....I have it on her Jan and it is so Precious. Don't Forget to Sign The Guest Book or Leave Feedback!